Lady Winifred White-Smith, née Winifred Agnes Kirkpatrick (1886- ). Sitter: Lady Winifred White-Smith, née Winifred Agnes Kirkpatrick (1886- ). Biog: Daughter of James Kirkpatrick, of Closeburn; m. (1910) Sir Henry White-Smith, Kt. (cr. 1921), C.B.E. (1918) [from whom she obtained divorce, 1925]. 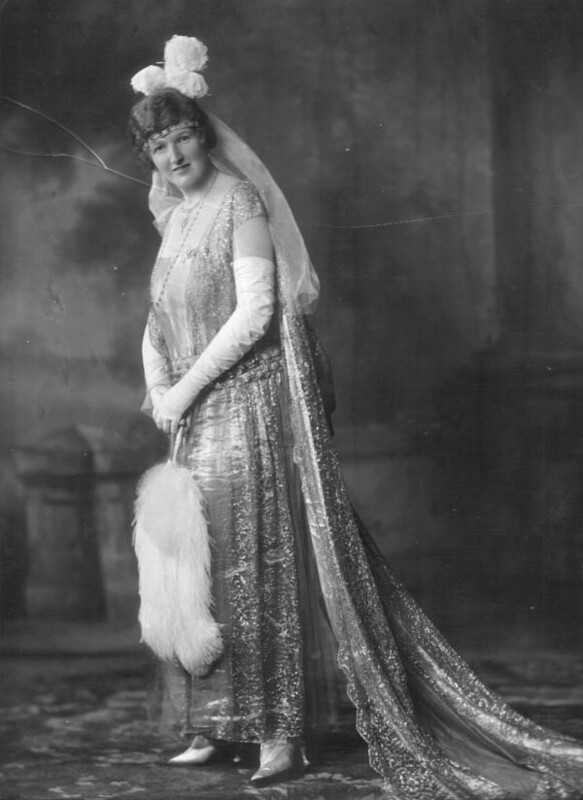 Occasion: The Court, 8 June 1922: presented by Lady Sykes. Location: The Lafayette Studio, 160 New Bond Street, London, W.
"A gown of leafgreen and silver over shimmering silver lamé, with purple iris colouring at the waist; transparent embroidered train of green and silver" (see: The Times, 9 June 1922, p 11e). Photographer: Lafayette Ltd., 160 New Bond Street, London. Occasion: The Times, 10 June 1922, p 11c. Costume: The Times, 9 June 1922, p 11e. Costume Supplier: The Times; 9 June 1922, p 11e.